For thousands of years, Oriental Medicine practitioners have known of and employed a vast array of herbs with medicinal properties. Western Pharmacology is now beginning to acknowledge these natural counterparts without the side effects of processed pharmaceuticals. In Oriental Medicine, herbs are almost always prescribed in conjunction with acupuncture and other treatments. They are extremely effective in unblocking the flow of Qi and fortifying the internal organs. Herbal formulas are specifically designed for the individual needs of the patient. It is unlikely that two patients, even with the same diagnosis, will receive the same herbal prescription. The following suggestions are meant for patients contemplating treatment with Chinese herbs. 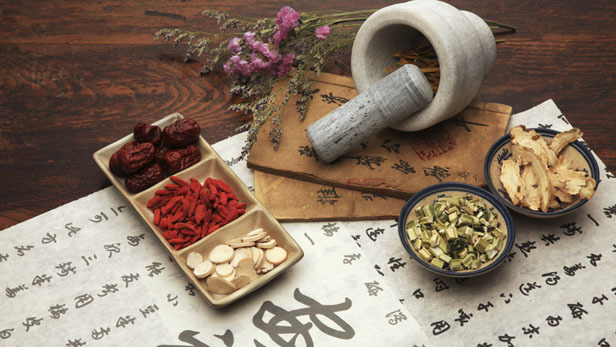 They are also meant for practitioners who have not studied Chinese herbal medicine formally. 1. Herbs should not be administered during pregnancy due to liability concerns. There is little direct evidence that commonly used herbs can be harmful to the fetus; however, we live in a very litigious society. 2. Tonic herbs and formulas are inappropriate during the initial stages of a cold or flu. In addition to making the body stronger, tonics may make the cold or flu more virulent. Instead of tonics, use specific cold and flu formulas and resume tonic formulas once the illness has run its course. Popular tonic herbs include ginseng, astragalus, codonopsis and tang kuei. 3. Herbs should not be indiscriminately used during menstruation, as herbs can increase the quantity and duration of bleeding. If there is a compelling reason to give herbs (i.e., the patient has a cold, flu, nausea or cramps), it may be appropriate to use herbs at this stage. 4. Patients who have food allergies, digestive problems, or who seem highly sensitive, should start out at a reduced dosage and slowly build up to a normal dosage. 5. The normal dosage of Chinese herbs in pill or powder form is at least 4-10 grams a day to get a therapeutic dosage. For herbal decoctions, 100 grams is usually the minimum dosage (please consult a trained herbalist for instructions). The above dosages are for 100-200 pound adults. Typically, children and animals are dosed according to weight. Individuals weighing more than 200 pounds typically need to adjust dosage accordingly. For example, a 50-pound child typically would get 50% of the adult dosage. An adult weighing 250 pounds would get 50% more herbs. 6. With few exceptions, Chinese herbs are always used in combinations. 7. Patients who have not used herbs before typically need lower dosages than those who use herbs regularly. 8. Autoimmune patients need to be carefully monitored as their condition often changes rapidly. 9. A professional should monitor herb usage at least once a week to start. This may change gradually to every other week or once per month. 10. Take herbs and drugs at least two hours apart. Whenever possible, take herbs on an empty stomach, at least half an hour or more before meals, or one hour after meals unless other instructions have been given by your herbalist. 11. Ideally, herbal pills should be taken with hot water. They should not be taken with coffee or other caffeinated beverages or carbonated drinks. 12. If you wish to take herbs while nursing, please see an experienced herbalist. 13. Select Chinese herbal products made in the U.S. due to superior quality control. Products made in Asia have been found to include pharmaceutical drugs and other impurities. 14. Follow your herbalist’s suggestions exactly. Inform your practitioner what you are taking.